Tottenham Hotspur manager Mauricio Pochettino emerged on Tuesday as hot favourite to succeed Jose Mourinho, sacked as coach of Manchester United. With the Portuguese gone, United may make their move for the Spurs boss, who has taken his club to consecutive top-three finishes but has yet to bring a trophy to North London. The Argentine was offered at odds of 2/1 against -- meaning one chance in three -- within minutes of Mourinho's sacking. However, rival bookmakers had former United defender and France manager Laurent Blanc emerging as the frontrunner with some putting him EVENS, down from 12/1, ahead of Pochettino. The Frenchman spent two years at Old Trafford from 2001, making 75 appearances, and has been out of work since leaving Ligue 1 side Paris St Germain in 2016. 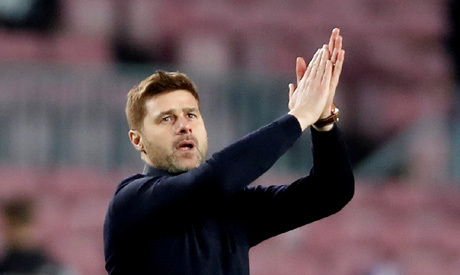 The Tottenham coach also said last week that he was happy at the club and looking forward to leading them into their new stadium next year and into the Champions League last-16 where they face Borussia Dortmund in February.